Interested in a career in international business? 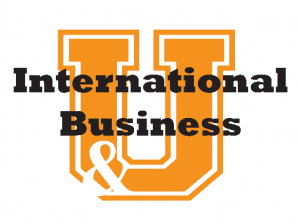 International Business & U is an annual conference hosted each fall. It is the premier international business student conference in the Rocky Mountain Region, bringing together students from 15+ universities and organizations from multiple states. International Business & U student conference brings students together from across the region to showcase different types of careers that can be achieved through international business and inspire students to travel for work and their studies. The conference is host to over 500 students, a variety of speakers and panelists including regional international business experts, students, young professionals, and start-ups, as well as an expo featuring universities, study abroad programs and organizations with specific international opportunities. This is a great opportunity for students who are interested in international business, studying abroad and working abroad. Professors have often brought their entire classes to the event and it has worked really well. Assignments that students have created after the event have been very influential in shaping the next event and upcoming programs at the World Trade Center Denver. Registration is free but required, in efforts to provide accurate seating and lunches. Join us to explore the opportunities that international business offers and how students can take advantage of those opportunities now! Interested in sponsoring the event? Contact Karen Warsh at Karen.Warsh@wtcdenver.org or 303-592-5369.